The easiest approach is from the East, turn off the B4521 at Broad Oak and follow signs to Garway, proceed through Garway Village and take the first right, signposted Garway Hill. Continue on this road for 1.8 miles at 51.920580, -2.804650 take the left hand turn up the track opposite postbox and wooden footpath sign. Proceed up the track, the turning area and parking is at the end. Garway Hill Parking is shared with other users of the common and limited to around 10 cars. Because of the limited parking and the remote location of the site for returning to after an XC, car sharing is recommended. The main NW take-off (A) is to the North West of the trig point and identified as the grass path and a small grass clearing within the braken. A second take-off area (B) is on the shoulder of the hill to the SW as the hill brow bends around to the South. A further take-off is available lower down on the SW side which can be used in stronger wind conditions. Due to the level of braken on the hill there is a limitation to the number of gliders than can be laid out. Top landing is recommend. The hill to the South of Take-off B on the map provides as slightly lower slope with the greatest clearing of bracken. Two bottom landing fields have been negotiated for use. 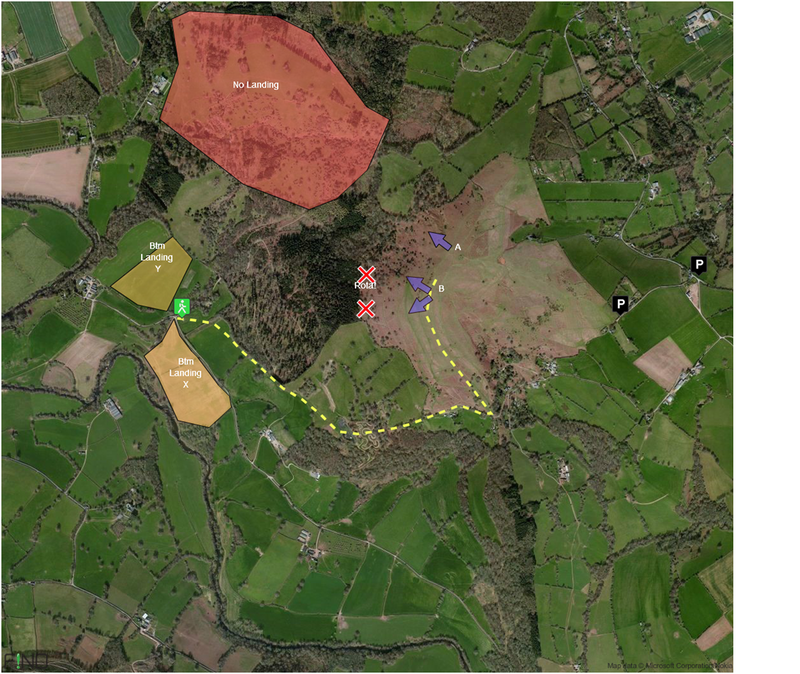 Both fields are owned by the same famer from Great Corras farm as marked on the map. Given a choice we recommend using the field marked as X on the map, this landing field provides greater potential for finding lift and is flatter. Field Y slopes away to the South West and is 40m higher than X. Please exit both bottom landing fields at the gates near the bottom of the footpath marked as the route back to take-off. Please note there is limited phone signal in the bottom landing fields. DO NOT – pilots are strictly prohibited from attempting to land within the Deer Park of Kentchurch Court. This area is very sensitive and is used by the Kentchurch Estate for shooting all year round including rifle target practice. It also is enclosed by high deer fence. This is essentially a cross country site and is not recommend as a ridge soaring hill due to the ridge lift being limited to around 4 gliders. The hill is also shared with a small group of model glider pilots that have a good understanding and relationship with the paraglider pilots. The model pilots are useful for indicating working lift and assuming the paraglider pilots intend to go XC will kindly move the models out of thermals to allow the paraglider pilots to climb out from the hill. On light wind days the thermals will often release from the tree line in front of the hill and a committed launch and glide may be required to connect with them. 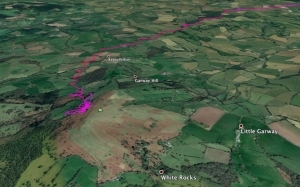 The lower slopes of the South facing hill running along the Monnow river valley will also generate thermals, on sunny light wind days it has been possible to connect with further thermals releasing from the edge of the river valley heading SE beyond Skenfrith. The woodland to the SW below launch causes some turbulence in stronger wind, with an area of rota directly behind the trees. There are also some obvious smaller trees on the slope just below launch which reduce the ridge soaring capacity of the hill. This site take-off is still awaiting final approval from the stakeholders. However a legal dispute between the Lord of the Manor and Commoners is preventing any final approval being concluded. As the site is already used and the bottom landing agreed, South East Wales has published the sites guide to ensure sensible and safe use of the site. This pilot takes a one-way ticket in a strong thermal out of Garway Hill. Retrieves can be frustrating due to the lack of public transport around Garway Hill. Flying 10 km could take you longer to get back than flying 50 km.